WITH THE TOUCH OF JUST ONE BUTTON, A DELICIOUS CAPPUCINO OR LATTE IS DELIVERED INTO YOUR CUP! 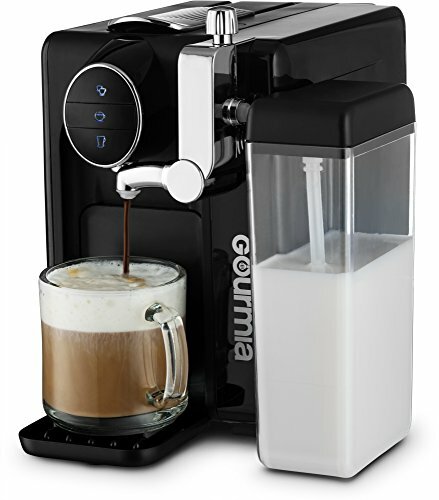 Bring all of the flavor of your favorite artisanal coffeehouse to your kitchen counter with Gourmia’s Italian Design Automatic 1 Touch Cappuccino Coffee Maker. For quality & taste like nothing you have ever experienced turn to Gourmia! This coffee & cappuccino maker includes several genius features including the easy to use control panel that allows you to easily brew specialty coffee drinks at the push of a button. The automatic milk frother lets you put the finishing touches on your coffee drinks. No one will be able to tell the difference between the coffeehouse and your own kitchen! The sleek & stylish design makes it the perfect complement for any kitchen countertop and a great gift for your favorite coffee lover, host or hostess.